Man. I thought the caramel ice cream was tasty, but this blows that out of the water. It is even deeper and richer, if that's even possible, and it was even creamier on the tongue. I feel a bit dizzy even thinking about this ice cream. You almost have to close your eyes when you eat it because it's so good. Honestly though, how could it have been bad? 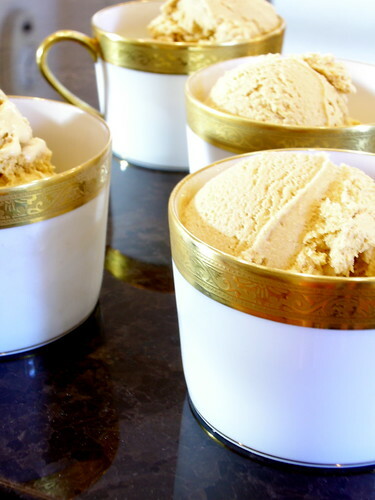 I mean, it is butterscotch ice cream for God's sake! 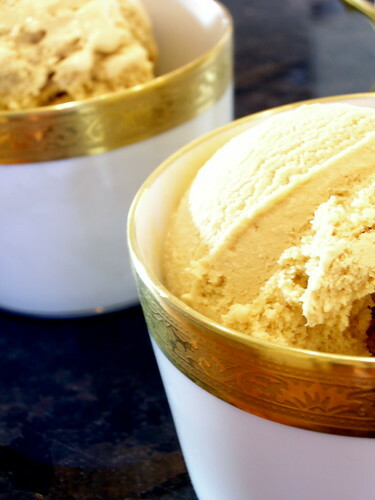 The smooth spheres of amber ice cream sitting in a dish are so enticing that I can't imagine anyone resisting. 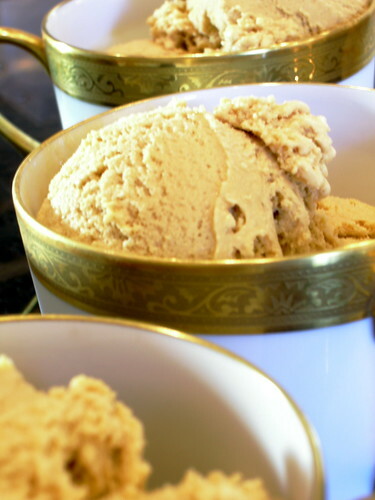 The thing I like best about this ice cream is not its tantalizing flavor, luscious color, or otherworldly texture but the quietness and humility of it. It doesn't scream at you; it quietly whispers to you, telling you of the wonders of its deliciousness. I really cannot praise this treat enough. It just makes you feel good when you eat it. It is yummy and comforting; in short, it is everything you could want in a dessert. Heat the sugar until it begins to liquefy around the edges. As the sugar melts, stir gently with a wooden spoon to prevent burning. Once the sugar begins to darken and the edges begin to bubble and the sugar begins to smoke, remove from heat and quickly stir in brown sugar and butter. Stir in 1/2 cup heavy cream, half-and-half, and salt. In a separate bowl, whisk egg yolks together, then gradually add some of the butterscotch cream to them, whisking constantly. Add warmed egg yolks back to the saucepan. Cook over low heat until the custard coats the back of a spoon. Strain custard into remaining 1 1/2 cups heavy cream. Chill thoroughly and freeze in an ice cream maker. you might be my hero for this one!